Noelle Healy starred for the Dubs. 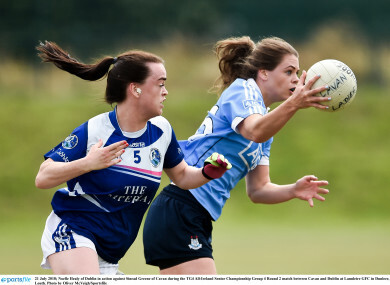 DUBLIN OPENED THEIR account in the Group 4 round-robin phase of the All-Ireland qualifiers with a commanding 13-point victory over Cavan in Dunleer, Co Louth, eliminating the Ulster side in the process. A brace of first half goals each from Noelle Healy and corner back Laura McGinley sent Dublin on their way. Despite the final score, the reigning All-Ireland champions didn’t have it all their own way in the early exchanges as they found Cavan with their sweeper system quite tricky opponents. Noelle Healy was a late replacement to Mick Bohan’s side, and it took her a quarter of an hour to stamp real daylight on proceedings, as last season’s Player of the Year finished to the net in clinical fashion. Aishling Sheridan, Cavan’s most potent attacker on the day, responded quickly by pulling a goal back from the direct kick out and she quickly added a point from play. Cavan captain Sinead Greene, who brought the fight all afternoon, then left a point in it, before Healy then played a quick one two with Sinead Aherne inside to find the net again. Having pressed up on the Cavan sweeper, Laura McGinley turned the screw for the Leinster ladies as she found the net twice in a devastating spell before half time, although she didn’t appear for the second period due to injury. Aisling Maguire did keep Cavan in touch with frees but Sinead Aherne had the final say on the half leaving it 4-8 to 1-7 at the break. Nicole Owens and Aherne added to their tallies upon the resumption as Cavan centre forward Maguire nibbled into Dublin’s unassailable lead. Wing forward Catherine Dolan finished a sweeping counter attacking move to leave six in it but it was a brief reprieve as Healy switched out the field with Niamh McEvoy who went inside and the move allowed both star forwards to find their groove. Healy found more space to fire over four second-half scores and then turn provider to set up McEvoy for her goal. The champions could afford to have Martha Byrne sin binned and the luxury of emptying the bench with the mouth watering prospect of Mayo to decide the group winners up next. Dublin: C Trant; M Byrne, S Finnegan, K Fitzgibbon; S McGrath, N Collins, M Ní Scanaill; L Magee, O Carey; C Rowe, N McEvoy, N Healy; O Whyte, S Aherne, N Owens. Subs: K Fitzgibbon for L McGinley (HT),K Murray for S Aherne (40) D Murphy for M Ní Scanaill (41), S Goldrick for S McGrath (44), J Dunne for N Owens (53). Cavan: E Bough; R Doonan, S Reilly, J Moore; S Greene, A Cornyn, S O’Sullivan; N Byrd, D English; C Smith, A Maguire, C Dolan; A Sheridan, B Sheridan, G McGlade. Email “Five-goal Dublin open TG4 All-Ireland championship title defence in style”. Feedback on “Five-goal Dublin open TG4 All-Ireland championship title defence in style”.